Caring for an aging parent, elderly spouse, domestic partner or close friend presents difficult challenges – especially when a crisis hits and you are suddenly faced with the responsibilities of elder care. Perhaps your aging mother fell, is hospitalized with a broken hip and needs to go to a rehab facility or nursing home to recover. Caregiving can also begin as a result of unsettling mishaps and warning signs that indicate a need for long term elder care. Perhaps your elderly spouse has wandered off and gotten lost several times. Or a long-time friend has lost a lot of weight and rarely leaves home. You may be the only person to step in and become the caregiver. Or, you may be the linchpin of a network of family members and friends willing to help care for your elderly senior. Whatever the situation, you are not sure of the next step, or even the first step. Caring for ageing parents or family can be exhausting and difficult, but you are not alone. Our experienced and friendly staff can help you understand elder care options. Regular medical checkup by our physicians at your doorstep. 1. 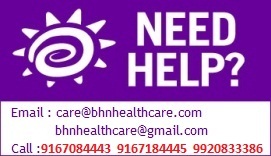 BHN has a tie-up with various hospitals. We would schedule appointment with your consultants if need be. 2. 24 hrs helpline available in case of emergency. Our ambulance would take you to the hospital nearby. 3. Co-ordinate your medical condition with your family members. 4. Keep a track of all your medical records. 5. Formulate a proper diet plan according to your health. 6. In case of hospital admission we will take care of all the formalities required right from hospital admission to discharge. 7. We also provide security system at home, so you need not worry if your loved one is at home alone.